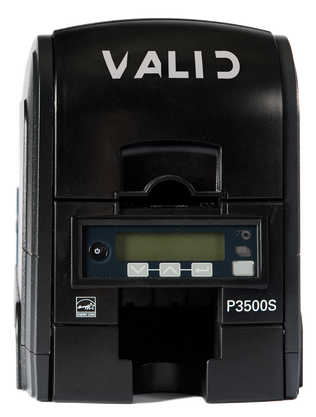 The Valid P3500S single-sided (manually flipping dual-sided) printer brings plastic card printer manufacturing back to the United States—print quality, print speed, and reliability are unquestioned with this best-in-class printer. It features standard Ethernet and USB connectivity and an LCD display that indicates printer status and easy-to-navigate menu options. The P3500S has an embedded operating system and a browser-based Printer Manager that is accessible through Ethernet or USB connectivity which allows for integration into just about any application or IT environment. 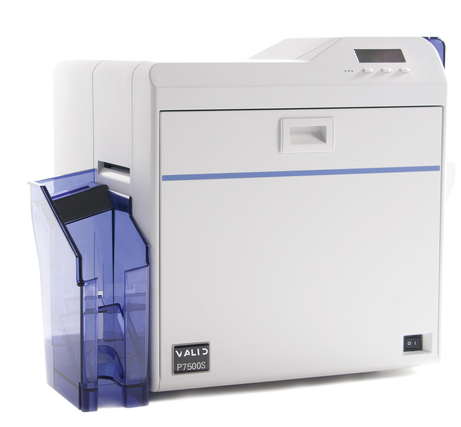 The P3500S printer is ENERGY STAR® qualified because it consumes less power, includes an automatic power-down button, and uses biodegradable ribbon cores. New integrated printing technology ensures the screen color closely matches the printed card colors. Get crisp, clean printing results consistently from every card. 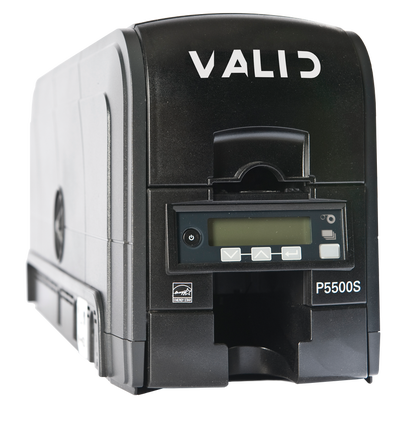 The Valid P5500S single and dual-sided ID card printer brings plastic card printer manufacturing back to the United States—print quality, print speed, and reliability are unquestioned with this best-in-class printer. It features standard Ethernet and USB connectivity and an LCD display that indicates printer status and easy-to-navigate menu options. The P5500S has an embedded operating system and a browser-based Printer Manager that is accessible through Ethernet or USB connectivity which allows for integration into just about any application or IT environment. The P5500S printer is ENERGY STAR® qualified because it consumes less power, includes an automatic power-down button, and uses biodegradable ribbon cores. New integrated printing technology ensures the screen color closely matches the printed card colors. Get crisp, clean printing results consistently from every card. The P7500S photo ID card printer is a dual-sided re-transfer printer with high speed USB and Ethernet connectivity. The P7500S printer is ideal for fast, high-volume card printing and contains a single or dual-sided lamination option. The proven re-transfer technique offers a brilliant glossy printed image with optional add-ons such as UV printing, custom holograms and topcoats which extend card life and enhance security. The P7500S has an optional in-line encoding unit for mag-stripe or contact and contactless smart card personalization.